The May 10th presentation will be held at McLaren Engineering in West Nyack, NY and will include discussion on new septic trench configurations, solutions for challenging sites for septic systems, including lakefront properties and steep slope design. There are still a few remaining seats available at the presentation. Use this link to RSVP or to obtain more information. Eric Murdock is a member of the Board of Directors for the New York State Onsite Wastewater Treatment Training Network and routinely conducts educational training sessions for regulators, engineers, designers, real estate professionals, and installers throughout New York State. 1. Overview of Advanced septic systems and why they provide more surface area. 2. Passive ATU – The next generation of Aerobic Treatment & Dispersal. 3. Wastewater treatment types, limits and actual system results. 4. Recognizing a failed septic system and selecting a new septic system. 5. Understanding why passive wastewater treatment & dispersal is here to stay. 6. New York State criteria and regulations. 7. Explanation of passive aeration and Aerobic Conditions = Supercharged Bacteria. 8. Overview of septic trench configuration and basic serial layout of bed. 9. Distribution Box System and Butterfly Layout. 10. Trench, bed and pipe sizing design tables. 11. Trench design procedure and examples. 12. Economical designs and site friendly installations. Eric E. Murdock, P.E. has been completing environmental designs throughout New York State since 1994. His wastewater treatment engineering expertise extends from conventional onsite wastewater treatment systems to the more sophisticated and higher performance Alternative Treatment Units. 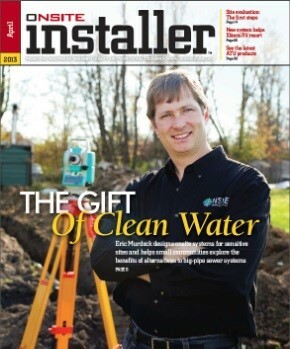 Eric Murdock, is an Environmental Engineer, and currently owner of Onsite Engineering, whose practice focuses on design, installation and maintenance of decentralized wastewater treatment systems for residential, commercial, and municipal clients. The presentation is organized by the PEs in Construction (PEC) Group of the New York State Society of Professional Engineers (NYSSPE). Click here for more information regarding the May 10th presentation.